-Who is the gentleman in the photo? Walter P. Chrysler. The photo was taken in 1924 when Chrysler was head of the Maxwell Motor Company. -Identify the manufacturer of this automobile. Maxwell Motor Company. Maxwell was re-organized into the Chrysler Corporation in June 1925. -What is the link between this manufacturer and the Vanderbilt Cup Races? Maxwell entered racers in the 1906 American Elimination Trial, and the 1908, 1909, 1910 Sweepstakes associated with the Vanderbilt Cup Races. No Maxwells participated in the Vanderbilt Cup Races held on Long Island from 1904 to 1910. In addition, in December 1909, Chrysler's first manufacturing job was superintendent of the Pittsburgh Works locomotive plant of the American Locomotive Company. This company manufactured the Alco Black Beast which won the 1909 and 1910 Vanderbilt Cup Races. He was later recommended in 1911 for his first automobile position (working for Buick) by James Storrow, a director of the American Locomobile Company. -What is the year and model of the automobile? 1924 Chrysler B-70 Roadster. It was named for the man not the company. Note the two-tone paint combination. -Why is this model historically important? According to the Walter P. Chrysler Museum, "Introduced as a product of what was then Maxwell Motors - the company Walter Chrysler took over two years after quitting as head of General Motors' Buick division - the first Chrysler set new standards for moderately priced cars. British automotive historian L. J. K. Setwright has referred to the 1924 Chrysler as perhaps the finest mass-produced car in the world when it was introduced. A pressure-lubricated six cylinder engine capable of sustained 70 mph speeds, air and oil filters, four-wheel hydraulic brakes, tubular front axle and an internally-lit dashboard with temperature gauge were some of the car's groundbreaking features. The success of the B70 turned Maxwell into Chrysler Corporation in 1925, and established Chrysler as "the engineering company." Congrats to Greg O, Bob Greenhaus, Henry Duke, Ariejan Bos and Len Williams for identifying Walter P. and the 1924 Chrysler automobile. Special Kudos to Henry Duke for identifying Maxwell as the manufacturer and the car's special features. Film "Walter P. Chrysler: A Machinist Visionary"
Film "Walter P. Chrysler Introduces the 1932 Dodge"
The only thing I can think of would be that Chrysler worked for ALCO very early on. It was the first branded Chrysler automobile. It also performed almost as well as most cars 2 and 3 times the price at the time. The car is a 1924 Chrysler B-70 six cylinder roadster. The model car is historically significant as it was the first Chrysler and the first production car with four wheel hydraulic brakes, among other technological innovations. 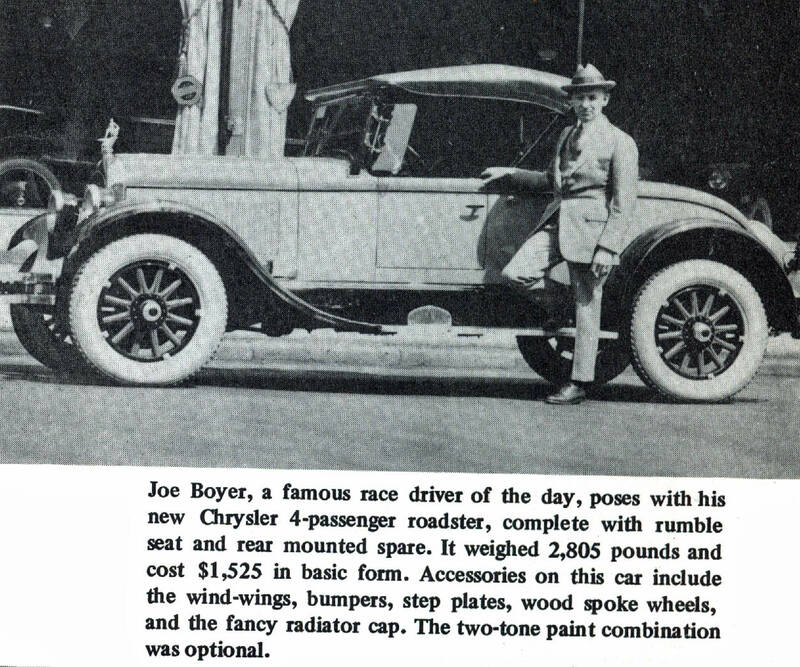 Perhaps the connection to the Vanderbilt Cup Races is that Chrysler worked for ALCO, builder of the Black Beast race car, before going into the automobile business. I don’t recognize the gentleman. I’m not sure if I hit submit on my follow-up, but I’m going to guess that the gentleman is Walter P. Chrysler. Sorry if I already sent it. Maxwell-Chrysler (or just Maxwell) made it. The Chrysler Corporation was formed in June of 1925. This is a 1924 model Chrysler roadster with the 2-tone paint scheme (all had black fenders). This was the introduction of the new Chrysler, with 4-wheel hydraulic brakes, full pressure lubrication (with a replaceable oil filter element), and a high-compression (4.7 to 1) 200 cu. in. engine developing 68 horsepower. This may have been taken at the introduction at the NY Auto Show at the Commodore Hotel. Walter Chrysler entered the automobile manufacturing business via his employment at the American Locomotive Company who made ALCO cars, which won the Vanderbilt Cup in 1909 and 1910. Chrysler, never with the auto side of ALCO, left for GM and Buick in 1911, and Durant bought him out in 1919, enabling Chrysler to buy Maxwell. This must be Walther P. Chrysler with a 1924 Chrysler B-70 roadster. The B-70, the first Chrysler model, was also the first medium-priced car with a high compression engine. The only link I could find with the Vanderbilt Cup races, was that Walther P. Chrysler worked as a works manager for Alco in the locomotive branch of the company around 1910, when Alco won the Vanderbilt Cup twice (in 1909 and 1910 of course). In 1911 he became works manager of the Buick Motor Company. i think it is the first year of production. i was not aware that Chrysler had any connection to the races. I am looking for info on a 1924 Chrysler Finer 70 identity no. 7280145, motor no H786, underneath 53951-2.